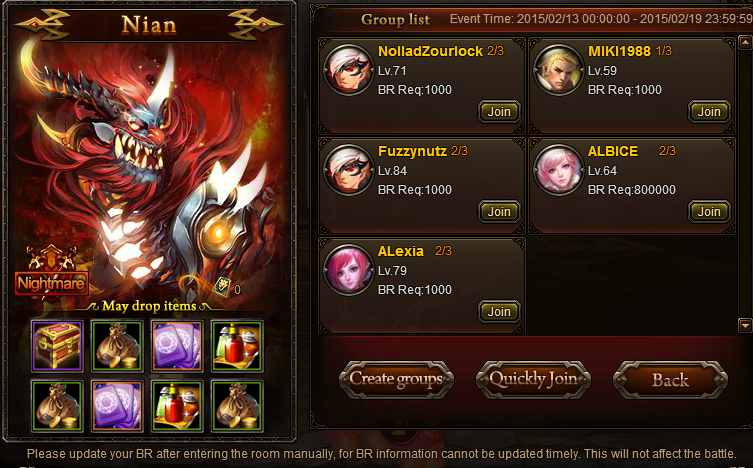 North America Forum»Forum ›Knights Fable ›Suggestions › Afk rooms on nian just to ruin other peoples game. Afk rooms on nian just to ruin other peoples game. Just did a nightmare and saw many rooms being made only to prevent people from using the quickly join. I suggest they put a opcion to put a lock on other rooms like the ones that got password in rooms that are afk there is no point in joing a room that the person have no interst in starting. I believe its a bug atm as ive also seen rooms with my name on and i would also get pulled into it and no functions in the room worked at all. All you could do was leave and try join another game. But then there are stupid people like Jeff228 who keeps making unlocked rooms but kicking people constantly. This coupled with rooms where people constantly pass lead are the reason for the bugged rooms. Once you get kicked out atleast 2 or 3 times, you cannot enter the room anymore unless the creator of the room that kicked you creates a new room and you can join. (Then get kicked again). Using the Quick Join function will ignore rooms that kicked you out of the room but if you manually join their room it\'ll give a pop-up saying you cannot join the room due to being kicked. 2019-4-26 02:37 GMT+8 , Processed in 0.049406 second(s), 38 queries .